This is a very realistic piece of art. I want to feel relaxed in my bedroom and this does the trick. I have it center on my wall but the picture is so inviting I feel like running though it. I would recommend and purchase again. 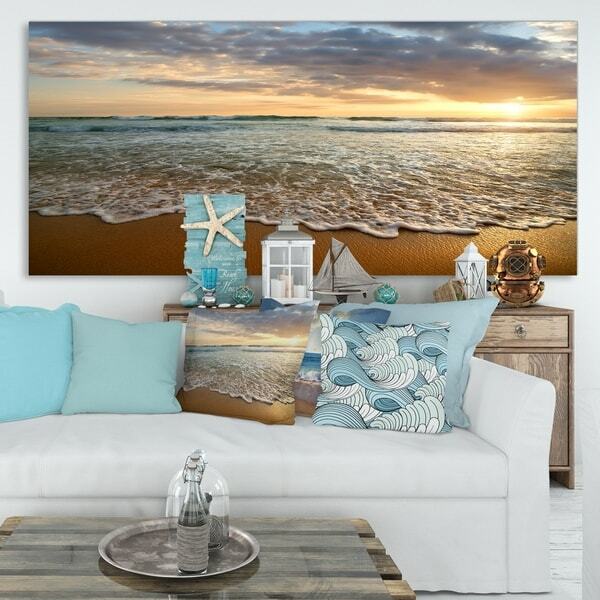 Welcome the oceanside into your living room with this striking photographic wall art. Depicting the sun glinting off a calm ocean lapping at the shore, this giclee print art arrives gallery wrapped for a museum-quality display. I love GOD so much. I bought this art piece just to remind me of his creations. Because he created all the waters that surround us. Beautiful! Colors are rich in a serene setting. This art goes with all room designs - from hobo chic to contemporary. The only wish I have is that buyers could have the art work framed by the seller for an additional price. It would be a nice convenience. When we moved from the mountains of Northeast PA to Coastal Delaware we wanted to lighten and brighten our wall art and this fit the bill perfectly. The colors are rich and this photo on stretched canvas has great depth. It was easy to hang and looks fine I framed. I recommend it. As pretty in person as it is on screen. My bedroom doesn’t have the popular tufted headboard. In fact, it’s pretty minimalistic. I had intended for this canvas to go somewhere else in the house but my husband really likes the art that was already there and didn’t want me to replace it. Luckily, I thought to put this above our bed. It’s so calming and it makes me want to make my bed every day to complete the whole serenity feeling. Serious! Beautiful contemporary Seascape Art. Great over fireplace. Very serene. Compliments living room. This canvas wall art is absolutely beautiful. Such a nice addition to my bedroom. This canvas art piece is just beautiful. I liked that Overstock offered different sizes and dimensions, so we were able to choose just the right one for the wall on which we wanted to display it. It is just as beautiful in person as it appeared on the website. We are very pleased. Beautiful Canvas Art, very happy without. When you look at this art canvas, you feel like you are at the beach. I have it hung over my bed and you can see it reflected in my dresser mirror. Love it! Appears just like the picture. Printed on canvas as listed. Arrived undamaged although is was an awkward shape to ship. This is stunning, perfect balance of colors for my room with blues and brown shades, great contrast of colors. It is very large, but it is all I have on one ten foot wall and it is perfect. 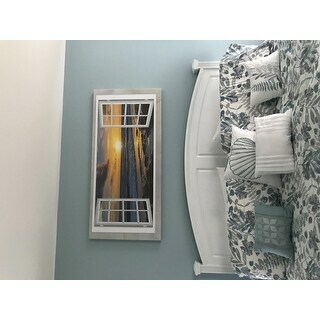 Loved this canvas print and it looks exactly like the picture! You will not be disappointed! I ordered an extra one for my sister's beach home! I purchased this large canvas print from my office, which is near the beach. I coordinated the colors in it with a modern area rug with graphic designs, and the combination looks fantastic. I feel like I can put my toes in the water. I can hear the waves in my mind. That’s how vivid this picture is. The handyman who put this up in my dining room thought he’d like to own this picture. So real!! This large canvas print is even prettier than I expected. It looks great on the large wall that I needed to fill. The ocean scene is very bright and cheery and makes the room look much more open. It was also very easy to hang. I didn't like the material of the picture but I did like the picture, so I am going to keep it anyways to hang in my bedroom. But next time I may not buy artwork again or send back if I don't like it. The canvas picture arrived on time and looks great.